elk kelp: Did you know? Elk kelp, named for its antler-like appearance, grows in subtidal forests off the coasts of southern California and northwestern Baja Peninsula. It is the second largest algae after the aptly named giant kelp. Elk kelp is anchored by a holdfast (similar in structure to roots) in sediment. At the opposite end, a buoyant oval pneumatocyst lifts the stipe (similar to a stem) up into the water. A strong storm can be enough to break the kelp at its stipe, so broken pieces of elk kelp can often be seen washed up on shore. Three ecotypes (varieties) of this kelp are recognized. They are thought to be in the early stages of speciation, meaning these ecotypes may branch off into unique and separate species given enough time. Each ecotype prefers a distinct habitat, for example calm rather than turbulent water or rocky rather than soft substrate. However, all elk kelp grows in temperatures of no higher than 60° Fahrenheit. Thus, continued rise in seas temperature could spell a major problem for this majestic macro alga. This is especially important, since elk kelp provides an important habitat for fish, sea cucumbers, and snails. Because of their important role in aquatic ecosystems, macroalgae like elk kelp are important foci of climate change and biodiversity research. 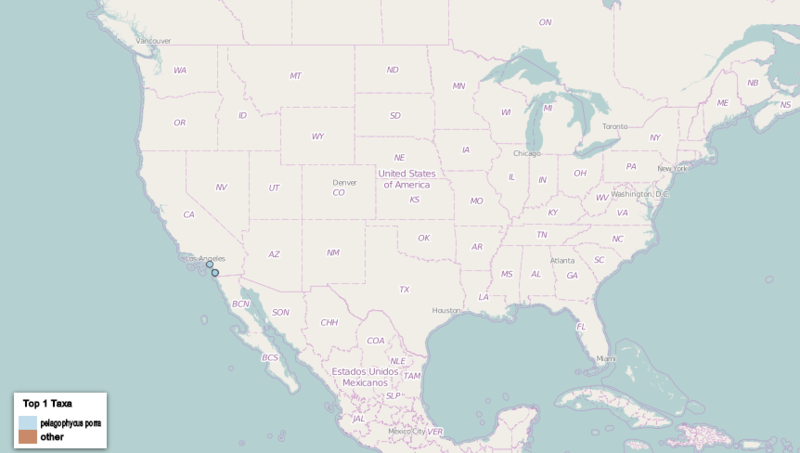 The Macroalgal Herbarium Consortium seeks to provide a data portal through which researchers can access images and important records of macroalgal specimens from 49 North American and Pacific Island herbaria. This database is significant not only to scientists, but also to educators, as it provides a tool for learning about the economic importance and diversity of macroalgae. Digitized Pelagophycus porra specimens in biological collections.